Gondor had mounted a series of "descents" (amphibious demonstrations or raids) earlier with its new Coastal Fleet, in support of full-blown land operations. On 21 June 1665 an expeditionary force was assembled under the command of Ulraed Curimardin to land in Lond Angren. The contracted naval escorts for the expedition were commanded by aerhîr (temporary and supernumerary) Ormond Raudfêrn, Luco Nepos and Alassar Abad-Eithel. The convoy was intercepted by Umbarean raiding force commanded by Lord Faltur Marös during Ulmo's Day, 1665 in the waters of Anfalas. In the early morning of 23 July, the Umbarean fleet of four men-of-war discovered the Gondorian convoy of 15 ships near Lómost, sailing to the west, and pursued it from the southeast in a windward position. Suddenly, the wind turned to the southeast. The commander of the Gondorian fleet, admiral Ormond Raudfêrn, then turned sharply south to regain the weather gauge and the Umbareans crashed in the middle of the Gondorian line, sailing right into the core of a high-pressure area. The Umbarean flagship Alcarin, commanded by Lord Faltur Marös, lost all speed and was hit by fire-pots shot from the Gondorian carrack Nimgaur. 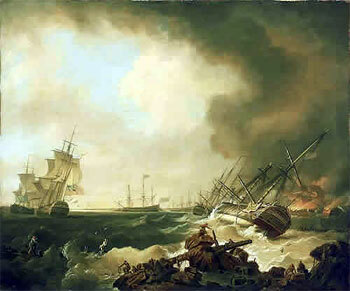 Several merchantmen were taken or sunk in the battle, but admiral Ormond mounted a furious counter-attack on Umbarean palanrist Morimandos, managing to take the man-of-war with three inferior ships, albeit with high losses. Alcarin and Coirë, pursuing errant merchantmen, were unable to join the main battle in time to save Morimandos or pursue the Gondorian convoy, which narrowly escaped to Haerlond. Captain of Morimandos, Valandil Marös, was taken captive with all his surviving men. In spite of heavy Gondorian losses, the battle proved indecisive.